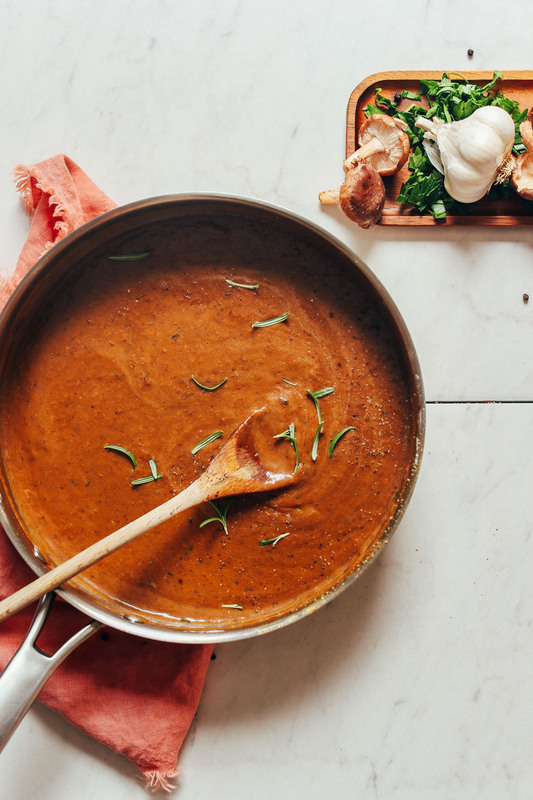 We’re inching closer to Thanksgiving and I couldn’t leave you all hanging without a good gravy recipe. For a while now, I’ve been dreaming up this version, which utilizes dried mushrooms for a richer, more intense flavor and color, and it seriously paid off. Let me show you how easy it is! 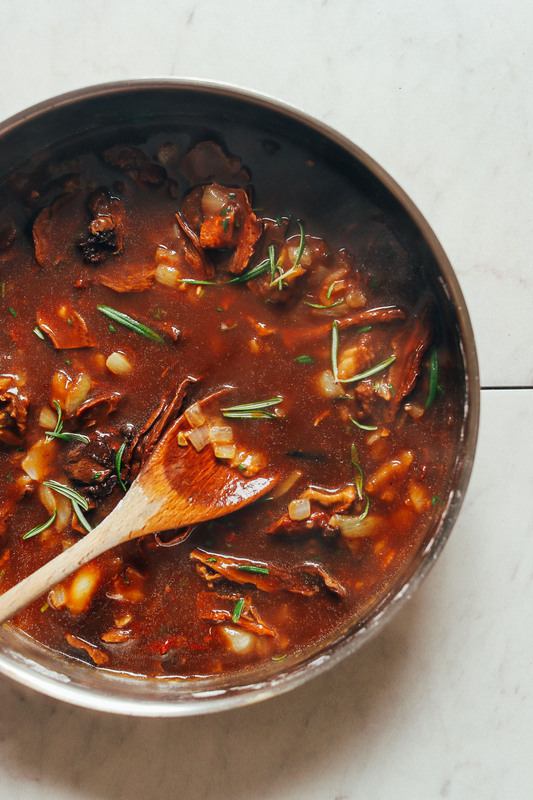 This 9-ingredient, 15-minute recipe starts by rehydrating dried mushrooms in vegetable broth. We went for porcini because their flavor is more woodsy and intense. But you can sub whatever mushrooms you’d like (or use fresh – see notes). While that’s happening, start sautéing onions and garlic in a saucepan. For thickener, I went for cornstarch, but you could also sub a gluten-free flour blend, all-purpose flour, or arrowroot starch. Stir to coat and cook for a couple of minutes to deepen the color and flavor. Next, you’ll add in your rehydrated porcini mushrooms and the vegetable broth as well as fresh herbs. We went for rosemary and thyme to keep things classic. But play with whatever flavors sound best to you. After a few pulses in the blender (or an immersion blender), this gravy becomes deep caramel in color and creamy smooth! This would make the perfect sauce for just about any holiday or special occasion meal. We found that it paired incredibly well with a mound of creamy mashed potatoes and a sprinkle of fresh parsley. 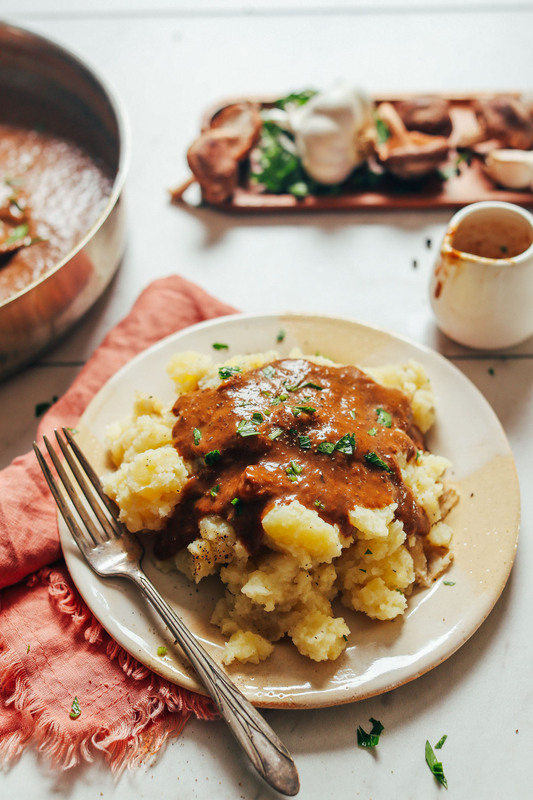 If you like this gravy, be sure to check out our Vegan Biscuits and Gravy, Mushroom Lentil Stew over Mashed Potatoes, Best Vegan Mashed Potatoes, Cauliflower Mashed Potatoes, and Easy Vegan Poutine! 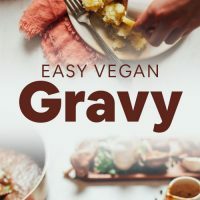 Easy-to-make 15-minute vegan gravy! Saucy, hearty, flavorful, customizable, and perfect for holidays, topping mashed potatoes, and more! Rehydrate dried mushrooms in vegetable broth in a large saucepan or pot. Bring to a simmer over medium heat. Once bubbling, turn off heat, cover, and let rest. In the meantime, heat a large rimmed pan over medium heat. Once hot, add oil (or water) and onion and sauté for 5 minutes. Then add garlic and sauté another 2-3 minutes, stirring frequently. Add cornstarch and stir to coat. Then cook for 2 minutes more. Next add herbs and mushrooms with their broth (reserving a little of the broth so you can play with the thickness) and stir to combine (see photo). Cook for 2-3 minutes. Transfer gravy to a blender (or use an immersion blender) and blend until smooth and creamy. You can leave some of the onions or mushrooms unblended for more texture. Then transfer back to your pan and warm over low heat for 2-3 minutes more. At this time, you can add a bit of almond milk to lighten the color and flavor a bit (optional), but we opted not to. Taste and adjust seasonings as needed, adding more salt and pepper to taste. If gravy is too thin, scoop out a small portion of the gravy and whisk in 1-2 tsp more of cornstarch until no clumps remain. Then add it back to the larger batch - repeat as needed until desired thickness is reached. If too thick, thin with a little of your reserved vegetable broth. Serve with dishes like mashed potatoes, biscuits, and more! Store completely cooled leftovers covered in the refrigerator up to 5 days or in the freezer up to 1 month. Reheat in a saucepan until hot and bubbly, adding more vegetable broth to thin as needed. 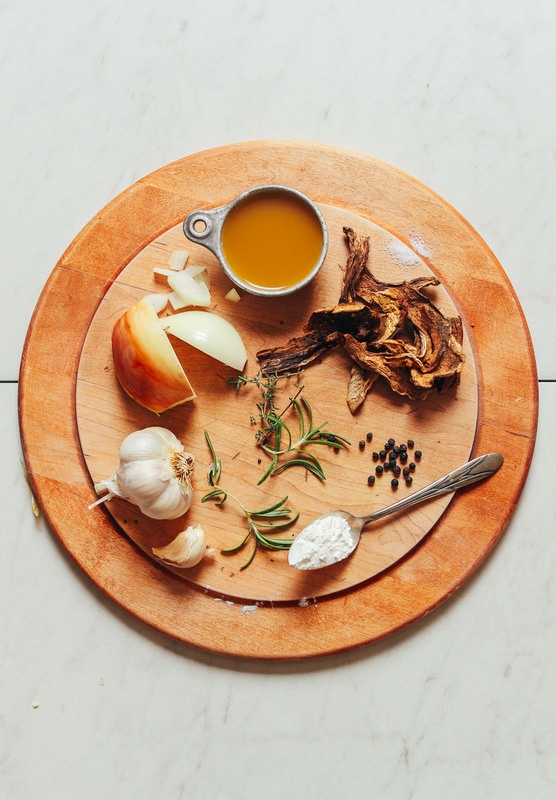 *If subbing fresh mushrooms for the dried, don’t add them to the broth in step 1. 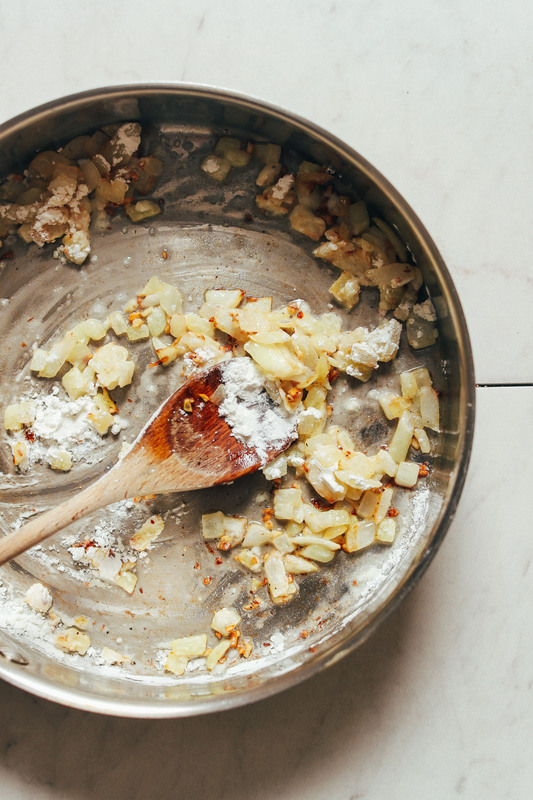 Instead, add them directly to the pan when sautéing the onions so they can reduce in size and caramelize. Then continue with recipe as instructed. Would love to make this lentil loaf and the gravy but need a substitute for mushrooms as they seriously upset me. I really love your recipes Thank you so much for sharing everything. Hi Ann, Just leave the mushrooms out or sub another vegetable you enjoy. I could even see roasted apples working nicely here! Hope that helps! A few drops of mushroom flavored, dark soy sauce helps with color and adds a little depth of flavor. Made this tonight to go with your vegan meatloaf along with some mashed potatoes and turnip and it was fantastic. Reminded me of Thanksgiving dinner. Will definitely make again! Thanks for the recipe!! Made this last weekend to pair with the lentil nut vegan loaf, and it was wonderful! I didn’t have any dried mushrooms so I used fresh, and although I did love it, I want to try it with the dried next time because I feel like that would have even more depth of flavor. 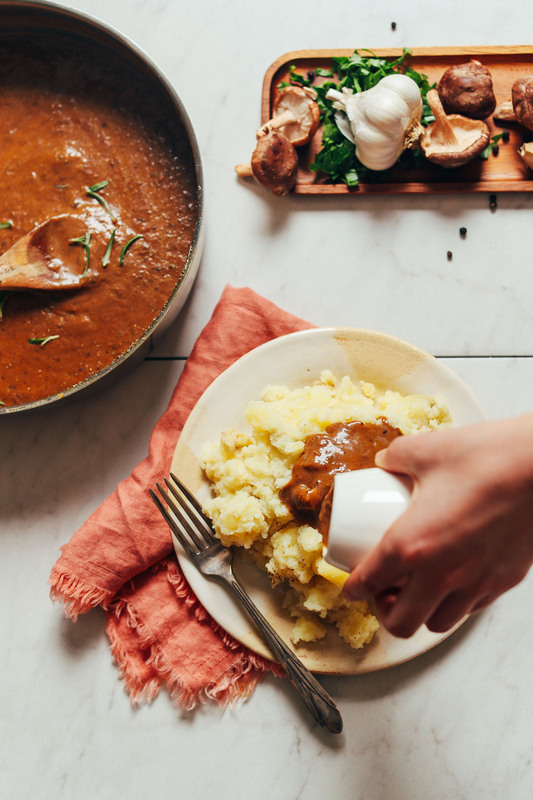 I have some russets on their way to my house now with my produce delivery, and I cannot wait to try this gravy tomorrow on mashed potatoes. I’m probably a little too excited, to be honest. Will definitely make this again. This was delicious, thank you! I made it so I could enjoy gravy at Christmas with the rest of the family…. in the end the other, meat-stock based gravy didn’t get made because my partner tried your version & said we didn’t need the other one too… big compliment. Hi, would dried crimini mushrooms work? I could not find any other kinds in the store. Thanks and Merry Christmas ! Merry Christmas to you as well! Crimini mushrooms will work! Best chocolate cake ever! I was really unsure how it turns out, specially with vinegar and avocado. I topped it with vegan chocolate flakes, but it was not necessary. Thank you for this recipe, we love, love love it! 10 Stars! Great! Glad to hear it, Gabriela! Thank for delicious recipe, greetings from Greece. Delicious. I’ve made it with dried mushrooms and again with fresh. It was really good both ways. Excellent! I just added some sage and tamari and it was perfect! I made this for Thanksgiving this year and it was super delicious! My color is lighter but it still tasted amazing. I plan on making it again as gravy to go with the vegan biscuits (will try this weekend). I love your recipes. Simple and delicious! Do you think white mushrooms will work? I already have them on hand. Not sure! If you experiment with them, report back on how it goes. Good luck! Made this for Thanksgiving and it was awesome! We loved how easy it was to make. I highly recommend using your own homemade veggie broth for this (see Minimalist Baker’s recipe for making your own. We’ll never go back to store bought!) Used all 3 cups and still needed to thin slightly with almond milk. Can’t wait to make this again! Yay! Thanks for sharing, Adrienne! Love the recipe. Making it today along with your lentil meatloaf. Made this for my non-veg family for thanksgiving and it was a hit! Tasted amazing. It was really thick though, so ended up needing to add about 3.5 cups veggie broth total and 1/2 c. almond milk to thin it out. Lovely – thanks for sharing, Alana! I made this for our family Thanksgiving yesterday. Most of my family are meat eaters, I am wfpbno, So sautéed with water. I followed recipe exactly. Amazing! I will be making this again. Thank you so much for sharing. Great! Thanks for sharing, Donna! Thanks for sharing, Caroline! SO glad you enjoyed it. xo! I made this for the vegan in the family on Thanksgiving and this is the best gravy we’ve ever had. Just made this to save time for Thanksgiving. Wow! It is so flavorful. Newly vegan and this is fantastic. Can’t wait to ladle this over your shepherd’s pie tomorrow :) Thank you! I would not recommend skipping the blender step as it is pretty key to the recipe. This looks delicious but as someone who isn’t really a fan of mushrooms, does it have a strong mushroom flavor? This recipe does have a mushroom flavor, yes. If you give it a try, we hope you enjoy it, Milz! Unbelievably delicious !!! I chopped up some carrots and added them to the sauce before mixing. Absolutely loved it! Yay! Thanks for sharing, Vanessa! Does it have a strong mushroom flavour? I want to try it but am not a huge fan of the taste of mushrooms. Hi! Making this today. Since I have only dried herbs, how much should I add of each? Thank you. Start with a little less than the fresh calls for and add more as needed. Good luck! Oh goodness, this will be on high rotation at home now! I made this on the weekend using fresh mushrooms and it is completely scrumptious. I’m slathering it on everything possible. Thank you for yet another amazingly fool proof delicious recipe. Did a test run today, to see if this would work for Thanksgiving. Used fresh herbs from the garden. Choose not to add the milk. It was wonderful. My husband, who is not a vegan, gave it a score of 9.5. This will definitely be on our Thanksgiving table. Yay! Thanks for sharing, Lori. So glad you both enjoyed it. 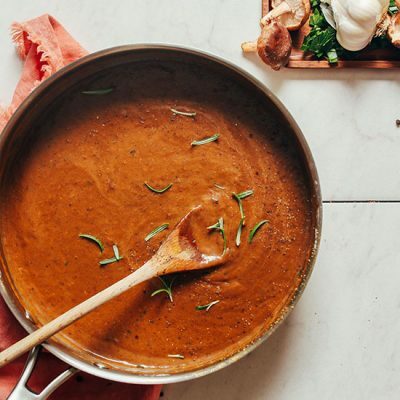 My new go-to vegan gravy recipe! I made this last night for dinner as a sauce for a vegetable stir fry. My husband and I both loved it! We used mushroom broth instead of vegetable broth and we used a bag of mixed dried mushrooms. Added a little extra AP flour at the end to make it a little thicker. The flavor was fantastic!!! Yay yay! Thanks for sharing, Adrienne! Turned out fantastic (as per usual on Dana’s recipes 😄). Added more mushrooms bc I didn’t have a food scale and struggled with what an ounce of mushrooms might be. Also had both fresh and dried so used both (shiitake and cremini) Turned out to be a lot thicker – like biscuits and gravy – gravy. Could have made it thinner with more broth, but why?!? Still delish and used it to dip homemade french fries (Idaho and sweet) 😋! Yes – you can thin with more broth or almond milk. Glad you enjoyed it! Yes, for up to 1 month! Thankfully I just stumbled across your website and I can’t wait to try your recipes. I have just been told, no more dairy or gluten in my diet! I would love to try this recipe for Thanksgiving, but unfortunately I cannot have mushrooms either. :( Any chance of changing them out with something else? Am, that’s a great suggestion. Replacing mushrooms entirely is a tough one. You could also just try adding more mushroom, garlic, and herbs. Still add the vegetable broth and deepen the flavor with tamari or Worcestershire? Possibly try chestnuts (cooked) and saute them along with the onion? I’m trying to make as much ahead of time for thanksgiving as I can as we travel between houses Do you think I could make this the day before? Any tips for reheating? You can totally make this the day before. As long as it’s not unrefrigerated for more than a few hours it’s totally fine to travel between houses and reheat on the stovetop! Thanks Dana! After continually checking out your book at the local library and always incurring late fees (it’s just too good to take back on time), I finally got my own copy today from Amazon. Thanks for all you do! Oh I think red wine would be lovely. Try adding 1/4 cup or so after sautéing the onion and garlic! Let it cook down, then proceed with starch / broth. red wine. It adds some acidity and it tastes delicious! Thanks for sharing! So glad you enjoyed it. Adding the red wine for a slightly alternate version sounds absolutely wonderful and I’d love to do that. Would I be eliminating the almond milk if using the red wine then?